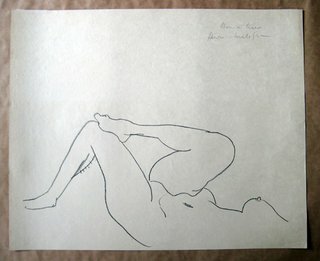 Reference: Henri Matisse, Catalogue Raisonee de l’oeuvre grave, Claude Duthuit, Vol I, number 92 Size: Sheet size 252 x 500 mms Edition: Bon a tirer. There were also 4 trial proofs, 10 artists proofs and 50 signed and numbered proofs. Public Collections: New York - Museum of Modern Art Bibliotheque Nationale, Paris Baltimore Museum of Art. Bibliography: Barr, p.445 - Duthuit “Catalogue Raisonee de l’oeuvre grave” number 460 Provenance: The stock of Henri M Petiet, Paris. The dealers stamp H.M.P in an oval, verso. Petiet was one of the most famous art dealers of Paris in the post war era. He bought the stock of Vollard on that dealers untimely death and proceeded to become one of the leading print dealers in Paris. The fact that our piece eminates from this source gives authenticity and prominence to it.